Heaven is something we see with our heart. 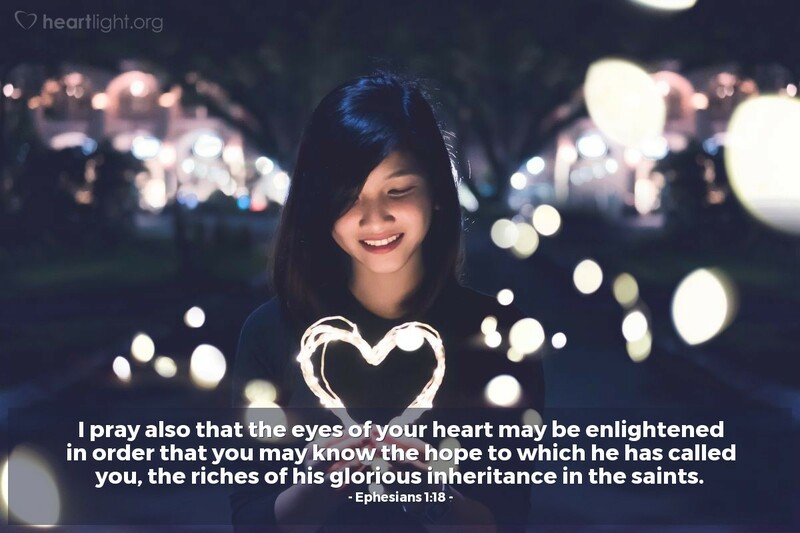 When we are discouraged, doubtful, and depressed, we need to have the eyes of our hearts "enlightened." The dawn needs to rise in our darkness and we see the dawn of hope and the riches of our inheritance. But when things look bad, sometimes the only way to remember these things is to sing them, pray them, and read God's promises of them. O God, you are my Hope. I trust in you and your promises. But I admit that at times, like even right now, I sometimes struggle with my confidence that you will act in response to my prayers and do what I've trusted you with my life to do. Please fill me with your Spirit and comfort my doubts and kindle my passion that I may serve you with boldness and share with others your grace. Through my Lord Jesus I pray. Amen.